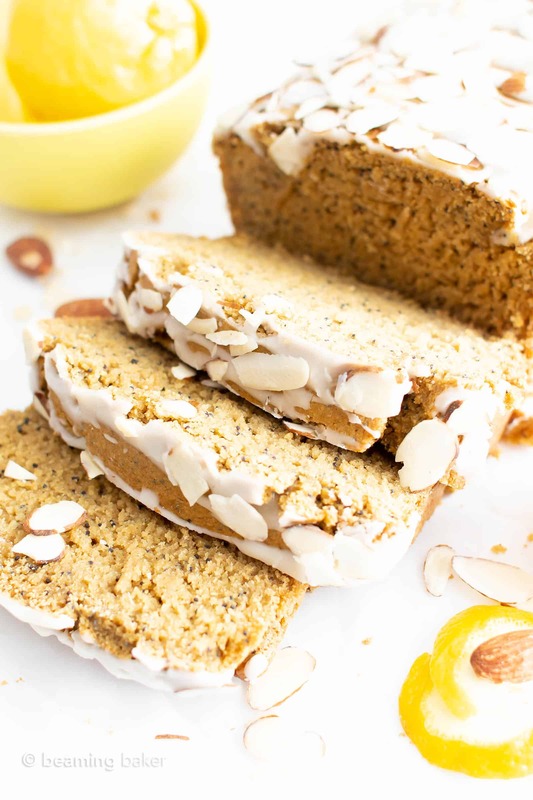 This easy gluten free lemon almond poppy seed bread recipe is moist, fluffy and bursting with lemon flavor! 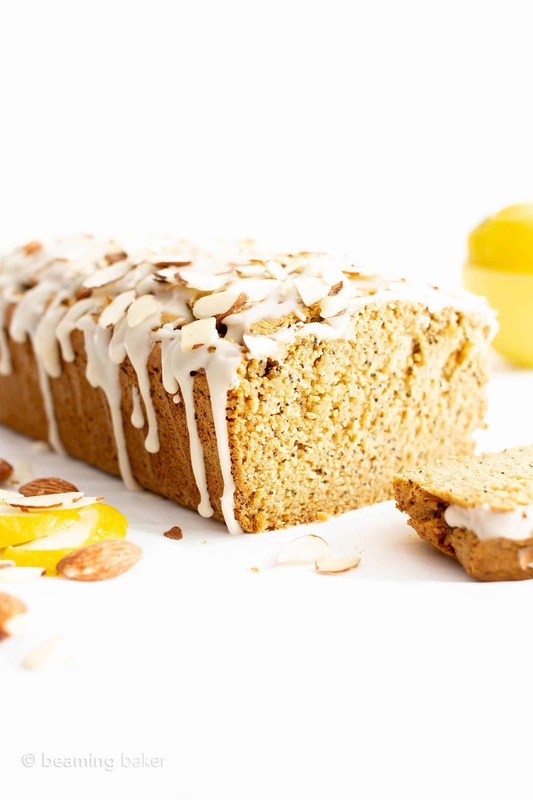 It’s the best vegan lemon poppy seed bread – gluten-free, dairy-free, healthy! Happy first day of Spring!!! Okay, fine, technically it’s the second day of Spring!!! Yeah! To celebrate, I’m sharing the scrumdiddlyumptious easy, vegan and gluten free lemon poppy seed bread recipe with almonds. It’s perfectly moist, just the right balance between sweet and tangy… and seriously such a showstopper. 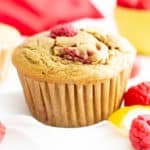 This recipe is adapted from my reader-fave Healthy Lemon Poppy Seed Muffins Recipe and my wonderfully gluten free Easy Orange Muffins Recipe. I love making this gluten free lemon poppy seed bread for my mom (hint: this would be the perfect Mother’s Day recipe), for brunch with loved ones (‘cause I’m not making this for folks I feel tepid about… j/k!!) and just for me (we all need a little more self-love and appreciation, ya know?). 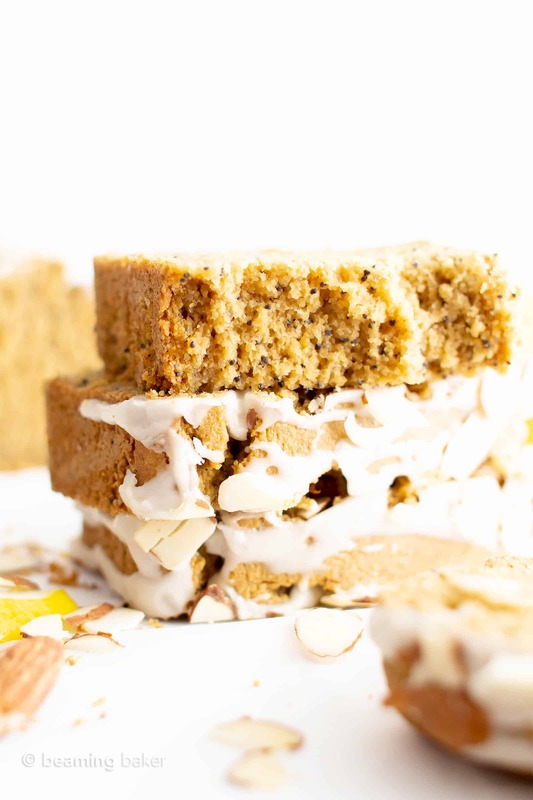 When’s the last time you truly loved a vegan + gf quick bread recipe? Folks are always telling me how so often the gluten free vegan quick breads they try are gummy, overly moist, tough as nails and just plain ‘ol tasteless. You know that’s not how we roll here. Heck no! This vegan lemon poppy seed bread recipe is fluffy, while also satisfyingly dense ‘n light (you know that sweet spot in between) and will shock your friends when you reveal it’s vegan and gluten free and made without refined ingredients. Whoop! Are you ready to kick Spring in the face, um, I mean, kick off Spring in the tastiest, tangiest way possible? Okaaaay, it’s not that tangy; it’s just the right amount. 😉 Let’s do this! Below, you’ll find answers to common questions, notes and tips on how to make the tastiest gluten free lemon poppy seed bread! GF oat flour: sub with gluten free all purpose flour. 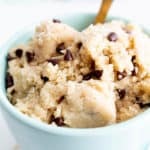 Do not substitute with coconut flour or almond flour—they won’t work as swaps in this recipe. 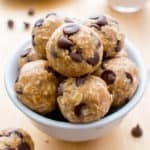 Blanched almond flour: try subbing the almond flour with ¼ cup additional oat flour. 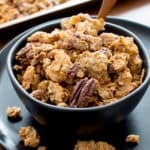 See how you like the texture—I prefer the recipe as written, but you might enjoy this/it might suit those who are nut-free. Coconut oil: sub with melted non-dairy butter or flavorless cooking oil. Maple syrup: sub with brown rice syrup, agave or honey (if not vegan). Unrefined Confectioners’ Sugar: a few readers have tried grinding coconut sugar in a small food processor to make paleo powdered sugar. See how you like it. Note: As always, proceed with caution. The more changes you make to the recipe, the lower your odds are that you’ll bake something awesome. After cooling completely, store your glazed gluten free lemon poppy seed bread in an airtight container at room temperature for up to 1 week. To freeze: cool lemon poppy seed bread completely and slice. 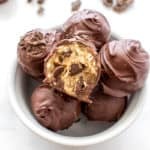 Place in a freezer-friendly container or bag. Freeze for up to 2 months. Thaw at room temp for about 30 minutes or heat in the microwave in 15-second increments until just warm. Wishing you the best Spring ever!! Filled with new beginnings, bright colors, even brighter smiles and joy. I hope that you and your loved ones absolutely adore this vegan lemon poppy seed bread! I can’t wait to hear what you think! 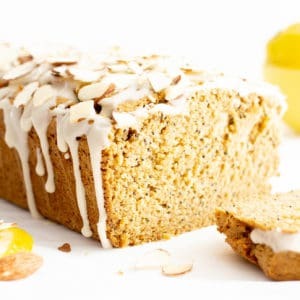 Easy Vegan Lemon Almond Poppy Seed Bread Recipe (Gluten-Free, Healthy): this easy gluten free lemon almond poppy seed bread recipe is moist, fluffy and bursting with lemon flavor! 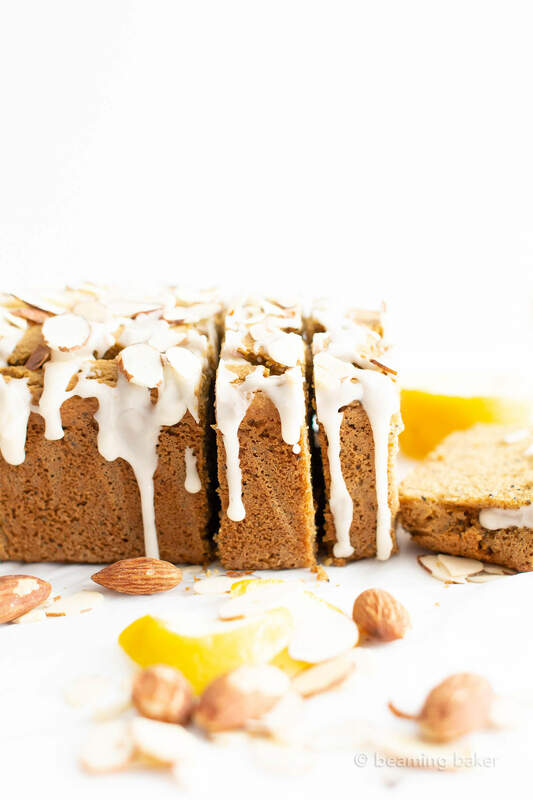 It’s the best vegan lemon poppy seed bread – gluten-free, dairy-free, healthy! Refined Sugar-Free. Preheat oven to 350°F. Line an 8-inch loaf pan with parchment paper or greased foil. Set aside. In a large bowl, sift together all the dry ingredients except salt and poppy seeds: oat flour, almond flour, baking soda, and baking powder. Whisk in salt and poppy seeds. In a medium bowl, whisk together all wet ingredients: water, milk, lemon juice, lemon zest, oil, sugar, maple syrup and almond extract. Whisk until well incorporated. Pour batter evenly into prepared pan. Using a rubber spatula, smooth batter into an even layer. Bake for 45-55 minutes. Mine took 50 minutes. Insert a toothpick in the center to check for doneness—once it comes out clean with just a few moist bits (no wet batter! ), it’s done. Allow to cool on a cooling rack for 1 hour. Then, lift out of pan, transferring loaf along with parchment paper directly onto the cooling rack. Optionally, in a small bowl, whisk together Glaze ingredients until thickened: confectioners’ sugar and lemon juice. Drizzle loaf. Top with sliced almonds. Allow to finish cooling for 1-2 hours. Slice loaf into 12 slices. Enjoy! Storing instructions below. Also try my Lemon Coconut Macaroons, Orange Cardamom Muffins, and Best Moist Banana Chocolate Chip Bread! - To Freeze: store in an airtight container or bag, unglazed, in the freezer for up to 1-2 months. Allow to thaw for about 30 minutes at room temperature before enjoying. Or, heat in the microwave in 15-second increments until just warm. - *Powdered sugar substitutes: Swerve powdered sugar is a good sugar-free, low carb substitute. You can also grind the sweetener of your choice, such as Xylitol, in a coffee grinder or small blender until you get a powder. Since Swerve is a bit drier, use about 2 ½ teaspoons lemon juice to make the glaze. Click the links below to check out my favorite tools & ingredients used to make this easy vegan lemon poppy seed bread recipe. Lemon Juicer – Erik, my official juicer, says this is the BEST juicer ever. Quick, easy and effective! Lemon Zester – actually an all-fruit and etc. grater. Super easy to use and perfectly sharp. 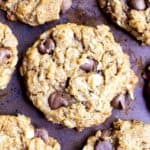 Homemade Oat Flour – my favorite recipe for GF all purpose flour. 8-inch Loaf Pan – such a sturdy and amazing loaf pan. Almond Flour – my favorite almond flour brand. Super finely ground, great quality and taste. 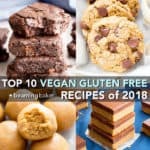 Coconut Oil – a gluten free vegan baking must-have for the pantry! I made this last night with the glaze and it was amazing! so light and refreshing with the lemon flavor. YUM – I love lemon in my desserts, this one sounds great. Can’t wait to try. Same here, lemon desserts are the best! Hope you enjoy it Rosa! I have a friend who’s vegan. I am sure she is going to love this. Making this for her. I think I’ll write the recipe on a pretty card and attach it. This is going to make a sweet gift. I’m always happy to find good gluten-free baked goods. My 15 yr old has Celiac Disease so wer’e always looking for them 🙂 Love that you used oat flour in this one. And lemon and poppy seeds are always such a delicious combination. This looks and sounds so tasty! 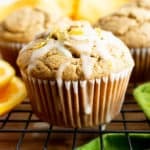 I’m a big citrus fan and love the idea of using oat flour in this too. Yum! Thanks Caroline! 😊 Then I think you’ll definitely enjoy this recipe! I’d LOVE a slice or two of this! It looks perfect! This is making me hungry! This bread look so good! So easy and delicious! Oh my, those pictures look to die for! I love a recipe like this, I’m crazy about anything lemon and poppyseeds bring back so many good memories. I have to get used to this though, I’ve never had bread like this! Only sweet sweet muffins. But I’m going to pin it for later: must try! These look simply divine! I can’t wait to make these at the weekend!! Woohoo! Can’t wait to hear how it turned out! This looks amazing! Can’t wait to make a loaf! This bread looks like a DREAM! Need to try ASAP! Haha more like a dream come true! 😂 Hope you enjoy it Taylor! Looks heavenly! I’m sure everyone will love this, need to make this soon! It’s seriously so good! Hope you enjoy it! I love it! Such a perfect spring treat!